Monoclonal antibody, molecular model. 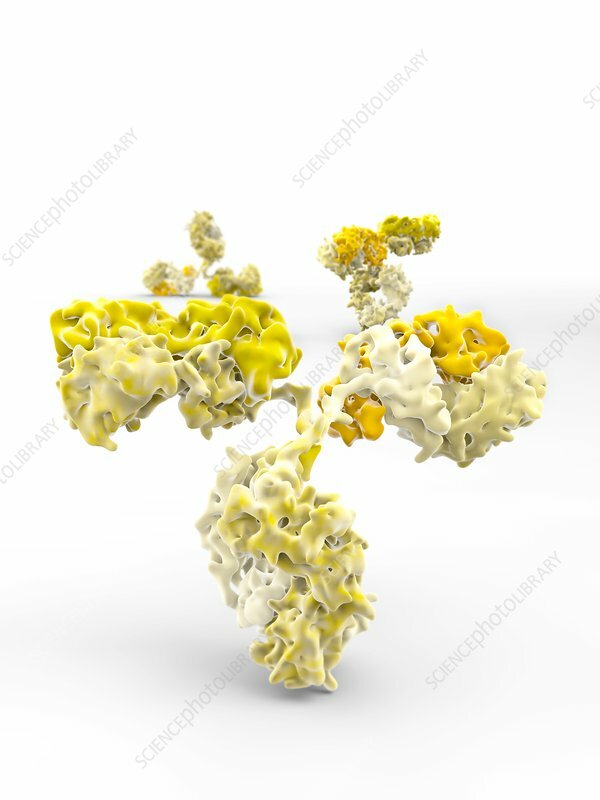 Computer illustration showing the molecular structure a single monoclonal antibody. Antibodies are large Y-shaped proteins that bind to specified biomolecules, used by the immune system to identify and neutralise pathogens. The antibody recognises a unique molecule or part of the molecule, called an antigen, via the Fab's variable region. Targeted monoclonal antibody therapy is employed to treat many diseases such as rheumatoid arthritis, multiple sclerosis, psoriasis, and many forms of cancer including non-Hodgkin's lymphoma, colorectal cancer, head and neck cancer and breast cancer.